New Zealand Thoroughbred foals destined for the racetrack are benefiting from a programme that sees them handled from as early as three weeks of age. The now well-established programme was born from a desire to break the tradition of bringing in foals for their first handling sessions at 4 to 6 months of age. Thoroughbred racehorses have high expectations put upon them at an early age. It is clear that whilst some adapt easily, others can struggle, and may become labelled as difficult, naughty, willful or even dangerous as a result of traditional training regimes that focus more on their ability to run than their manners on the ground. Leigh Wills, Sally King and their colleagues take a new approach, working with much younger foals to make their ultimate transition to a racing career easier. The women, mentored by Dr Andrew McLean, devised a program of early intervention suited to the Thoroughbred breeding industry. Starting no earlier than three weeks of age to avoid interfering with the mare-foal bond and ensuring the foals are both physically and mentally capable, the team work with the mare and foal to establish basic behaviours related to haltering, acceptance of touch all over, leading (including “go”, “stop” and “turn”) as well as feet handling. Each foal is trained over six to nine sessions of around 10 to 30 minutes each and over no more than three consecutive days. The programme uses the 10 principles of equitation science and learning theory laid out by International Society for Equitation Science (ISES). 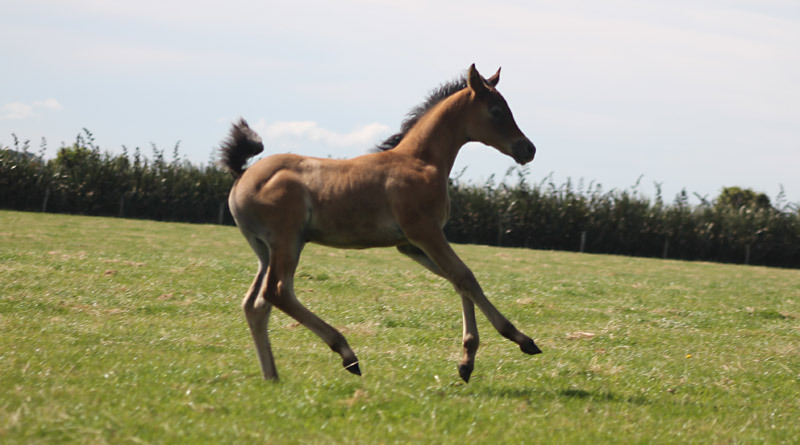 The foals learn simple cues and to perform basic handling and management related the behaviours consistently and reliably. The team, working under the name Equus Education, has worked over the last decade with more than 2300 foals in more than 18,000 training sessions with no injuries to either mare or foal. They have formed working relationships with well-known and respected New Zealand breeders who describe their work as invaluable. About 150 foals every season are put through the programme at Windsor Park Stud. The programme is also endorsed by Sir Patrick Hogan, founder of world-renowned Cambridge Stud. Wills and King gave a demonstration of their work at the ISES annual conference in Australia late last year, working with mares and foals at Charles Sturt University.